I'm sure you are getting tired of me saying this but -- when I was at the Book Expo -- I came across the EDC Publishing/Usborne Books booth and I was amazed at the wide variety and assortment of activity cards that they offered from this series. (I didn't realize their was such a long line of cards!) They kindly sent me some samples and we have been looking through them and enjoying them. 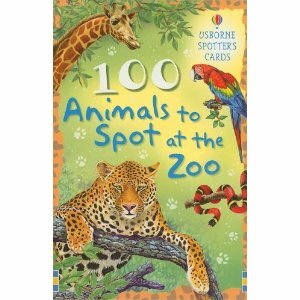 We took the 100 Animals to Spot at the Zoo (Spotter Cards) with us on our zoo trip a week ago. On the way up I handed the cards over to Bookworm1 and he was entertained by looking through the cards and guessing at which animals we might see on our visit. When he wanted to know more about a particular animal, he would hand the card over and we would read the information the card provided. 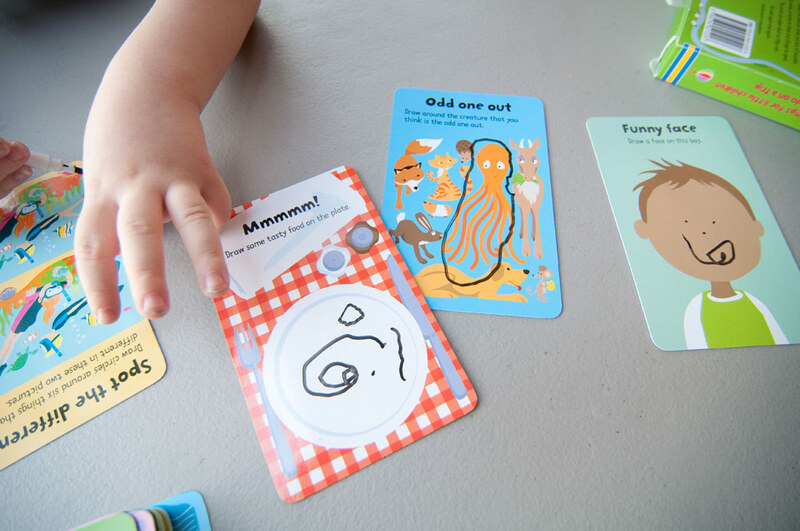 The cards told us where the animals originated, what they like to eat and certain behaviors. At age three, I only read Bookworm1 the pertinent information but there was plenty of details for older kids as well. 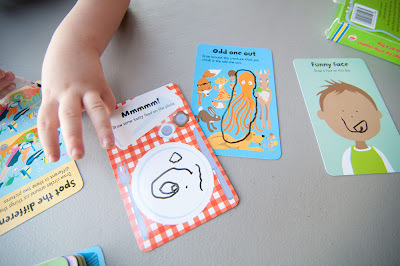 I would say that these cards are probably best suited for ages 4-10 but they suited our purposes quite nicely. We did not take them into the zoo, although that is their intended purpose. They are designed so that you can walk the zoo with them and learn from them as you go. We used them more as preparation and entertainment as we drove to the zoo and that worked great for us. I'm sure you can come up with your own ways to use the cards as well. They were quite fun. After celebrating Space Day - I was very curious to check out 100 Things to Spot in the Night Sky. Now these cards are over our head but that didn't stop me from flipping through them and explaining constellations and meteors to Bookworm1. I'm going to definitely hang on to these cards and use them on some summer evening when Bookworm is old enough to stay up until after it is dark so that we can do some star gazing from our deck together. These cards are AWESOME and guide the user to find constellations in the night sky. There is a "Starting Star Spotting" card to get you going, as well as a Northern sky map. Each card then provides you with something to look for and a description to help lead you along. Look for things like Canis Minor and learn about the phases of the moon. Use a telescope or don't, but these cards make star gazing a little more exciting and entertaining. Definitely something to have on hand for the next Space Day! 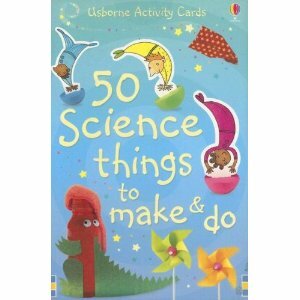 Lastly, we checked out 50 Science Things to Make and Do. This is a particular awesome deck of cards to have around during the summer time. It offers a variety of activities you can do with your kids (and they can potentially do on their own!) to explore their world. There are plenty of things to do and because they are all a bit over our heads as well, and because the Book Expo has given us plenty to keep us occupied with, I'm going to offer to send this set of 50 Science Things to Make and Do to one of you! I do think these things look awfully fun but why should we sit on them when one of you can be USING them! Enjoying exploring the world with your kids this summer! Hope you have fun. Thanks, EDC Publishers, for allowing me to check out your cards. You guys do an awesome job creating quality products and this mother is grateful for you! THIS POST WAS ORIGINALLY POSTED AS A GIVEAWAY. THIS GIVEAWAY IS NOW CLOSED. Again, just too many to pick from. What clever little cards! I love the zoo one, especially because we're going to take our daughter for her second visit in just a couple weeks. The other cards that caught my attention were the ABC and Telling Time ones as those are areas we're starting to work on with her. My own personal favorites were the 100 Things to Do on a Trip (we needed things like this when I was a kid!) 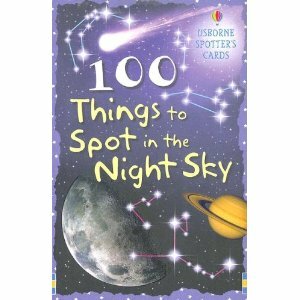 and the 100 Things to Spot in the Night Sky, but then I'm a big fan of star gazing! Again, I'm bookmarking this site to check out further when I have a few more minutes. Love it! Monster Doodles looks like lots of fun! As does the Science Things book in the giveaway! Actually, 100 Animals to Spot at the Zoo looks like great fun. I am going to have to order that set for our zoo trips this summer. Other than that one, I also am very interested in the ABC cards, and the 30 Healthy Things to Cook and Eat. The ones you are giving away look like great fun. My older girls would have a blast with them. Loving all your give aways. I want them all! I think the flash cards that would go over well at our house (if I had to pick just ONE), would be Big Machines to Spot. I have to admit it's the zoo animals one, that looks way too cool! Wow there are a ton to chose from. I like the 50 Travel Games and Activities. There are so many great ones! Three really jumped out at me. And Jordan is really into drawing monsters lately and I know he would get a kick out of Monster Doodles.